Overcrowding at a prison could lead to unrest, a report has concluded. 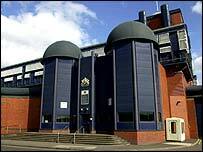 The Independent Monitoring Board said overcrowding was everywhere at Birmingham Prison and "undoubtedly has a detrimental effect." Prisoners arrived at all hours from courts and police cells all over the country, the report said. However, the report notes that so far there has not been any violence of note and that prisoners and prison officers are tolerant of the situation. The IMP report, led by chairman John Smith, said if overcrowding was not tackled there was a potential for unrest. But it noted prison staff at all levels had worked hard to cope with the overcrowding. Brian Clark of the Prison Officer's Association said the prison was not violent. "Birmingham Prison has operated at its capacity for every one of the 24 years I have worked here," he said. "It continues to be a safe and decent place." The prison, in Winson Green Road, has capacity for 1,402 prisoners.